Join us and meet artist Ignat Ignatov Friday evening October 7th (the first Firday). He be showing off his newest works. The reception will last from 5:00pm till 7:00pm here at the gallery. All are welcome!. Portraits Anyone? Spouses / Children..
"Will" | 16x12 Oil | Painted on location at LePrince Fine Art by Ignat Ignatov. Ignatov will be painting several live portraits during his visit to Charleston in early October. Call the gallery to schedule. Space is limited. Live sit portraits are so much fun. They take about 3-4 hours consisting of 20-30 minutes of painting/sitting followed by 5-10 minutes breaks until complete. Your family can watch the canvas come to life and are welcome to take photos of the experience. 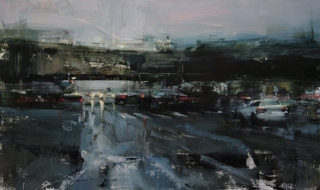 LePrince Fine Art welcomes Tibor Nagy!